Yes, we know the Library is empty and that there really is no rest for the weary. For all the rising seniors out there, who just finished a grueling junior year, it’s now time to start thinking about actually applying to college. Educators agree that the process of applying to college in the fall of a student’s senior year is the functional equivalent of taking an extra class. The more work a student can do over the summer, the easier the fall will be. Here’s a list of things rising juniors can work on over the summer to get a head start on the application process. 1. Finalize Your College List. Come up with a list that only includes schools you would actually attend. It is likely that a few colleges will move on and off your list in the fall, as you go to college visits at your high school or visit schools in person, but it is important to have a core list that reflects the kinds of colleges in which you are interested and includes likely, possible and difficult schools. 2. Complete Your Resume. If you use Naviance at your high school, you can use it to complete your resume. If not, go online and find a sample resume to complete. (One example website: http://www.aie.org/finding-a-career/sample-resumes-and-templates/) You will need your resume to give to teachers and counselors to aid them in writing your letters of recommendation, and it will also provide a list of all your activities that will help you complete the activity section of each college application. One tip – once you think you are done with your resume, show it to your parents, since there may be something that you forgot. 4. Create Your Common Application Account. On August 1, but not earlier, you can log on to the Common Application and create your account. The login page can be found here: http://www.commonapp.org/Login Don’t create your account before August 1, because the Common Application starts everything over at the beginning of each application cycle. Once you have created your account, you can add the colleges to which you intend to apply, which will let you see their supplemental essays. If you have completed your essays for the Common App and any state school to which you want to apply, you can begin on your supplemental essays before the fall as well. 5. Review Test Scores and Prepare for Fall Tests Dates. If you are unhappy with your test scores, or need them to be a little higher for some of the schools on your list, the summer between junior and senior year is a great time to do final test preparation for one more round of standardized tests in the fall. It is also the time to make sure that you have taken all the tests required by the schools on your list. I know this sounds like a lot of work, but trust me, it will be much easier to get it done now, in the summer, than in the fall when classes start up again. Just think how much more sleep you’ll be able to get in the fall by getting a head start on your applications now! 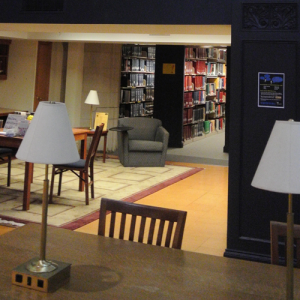 PHOTO CREDIT: A special thank you to EKD for the use of this photo inside Vassar Library.